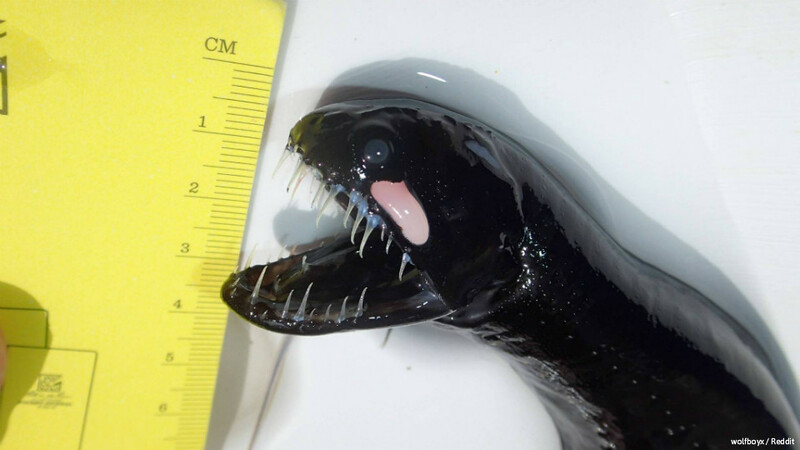 New pictures of the rarely-photographed black dragonfish (Idiacanthus atlanticus) have surfaced online. First described in 1906, the black dragonfish is a “sexually dimorphic” species, meaning that there are obvious physical differences between males and females. While the males are just 5 cm long and have no teeth or chin barbels, the females can grow up 40 cm long and have thin sharp teeth. The species lives in subtropical and temperate waters, swimming at depths of up to 2,000 m below sea level. In a SubReddit thread, user “wolfboyx” shared photos of the creature that were supposedly taken after it was found floating in the water. The official Facebook page of Discovery Channel Southeast Asia shared the photos on their timeline.